Photo of the yard with one ship on the berth, close to launching and two ships alongside in the river. The Tyne Iron Shipbuilding Co Ltd was set up by William J Bone in 1876. Bone had been the yard manager for the Cole Brothers who had previously used this site at Willington Quay. The yard grew from an initial four acres to include all of the land east of the Clelands yard and in so doing became one of the leading Tyneside yards. In 1901 J Bourne formerly of Armstrong, Mitchell and Co took over from Bone as manager with GF Mulherion as General Manager. They remained in charge until the yard’s closure. During WW1 the yard output was 10 tramps, three naval patrol boats and two naval tankers. The yard never recovered from the slump of the 1920s with no ships completed at all in 1926. The yard closed in January of 1927, having completed just over 200 ships. In 1928 the yard was sold to Armstrong Whitworth to complete a few more tramps, before the yard was finally closed in 1933. 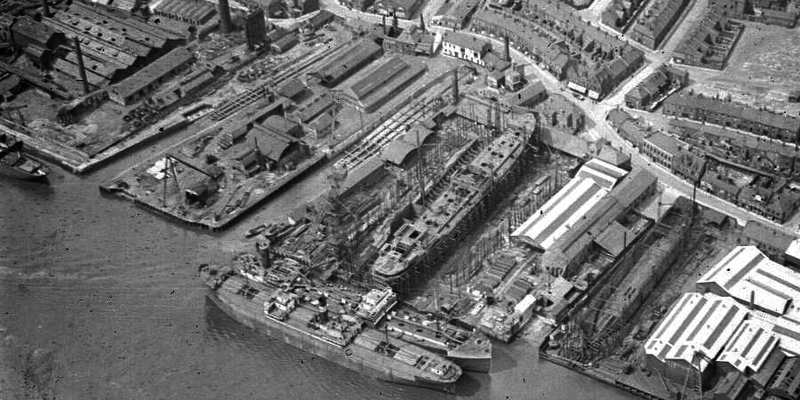 The yard was sold to National Shipbuilders Security in 1935 and was dismantled in the same year.